Antique, American Brilliant Cut and Etched Crystal Vase, 6" Tall, Made between 1890 to 1910, Priced individually... Select the quantity wanted. 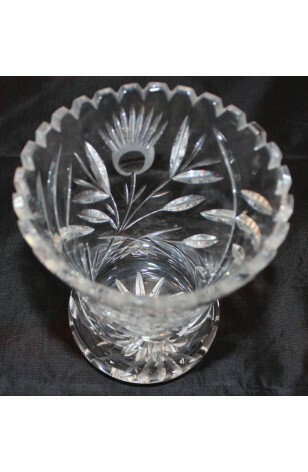 Beautiful Antique American Brilliant Cut Crystal Vase, 6" Tall and 5" in Diameter. Vase has an Etched Sunflower on the Two Sides and a Squared Off Saw-Tooth Rim. Base is Cut in a Star or Daisy Pattern. Beautiful Crystal Sound as well. Age stated is approximate.. according to our research, it appears to be made between 1890 and 1910.